After months of lying low, Greece‘s neofascist Golden Dawn party has returned to the streets, vowing to contest local and European elections under a new name to circumvent a possible ban. The Greek far-right party, Europe‘s most violent political force, announced members would form a new outfit called National Dawn if it is prevented from participating in the poll because of an ongoing inquiry into alleged criminal activities. “Patriots will have a party to vote for in the next election if [authorities] go ahead with the coup to ban Golden Dawn,” Ilias Kasidiaris, an MP and leading light of the party, told thousands of black-clad supporters gathered in central Athens. 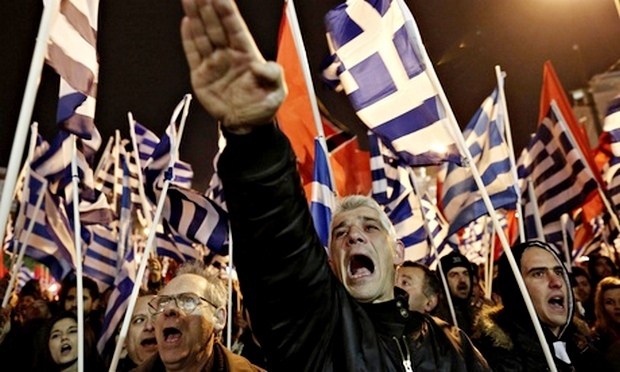 Tags: elections, far-right, golden dawn, Greece, Kasidiaris, National Dawn, Neo-nazis. Bookmark the permalink.